Acacia savanna south of Fada N'Gourma, Burkina Faso. 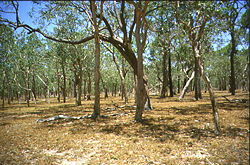 Typical subcoastal Eucalyptus/Melaleuca savanna in Northern Australia demonstrating the high tree density and regular spacing characteristic of many savannas. A savanna or savannah is a tropical or subtropical woodland ecosystem characterized by the trees being sufficiently small or widely spaced so that the canopy does not close, above a continuous tall grass understory. The open canopy allows sufficient light to reach the ground to support an unbroken herbaceous layer consisting primarily of C4 grasses. There are three basic subcategories of savanna-wet, dry, and thornbush—depending on the length of the dry season, which can vary from three to five months, five to seven months, or even longer. Alternative subdivisions include woodland savanna, tree savanna, shrub savanna, and grass savanna. Some classification systems also recognize a grassland savanna from which trees are absent. This article deals only with savanna under common definition of a grassy woodland with a significant woody plant component. Regardless of subcategory, all savannas can be defined as tropical or subtropical vegetation types with a continuous grass cover occasionally interrupted by trees and shrubs. They are also characterized by seasonal water availability, with the majority of rainfall being confined to one season of the year. Their main growth patterns are closely associated with alternating wet and dry seasons. Animals within savannas have adapted to surviving the seasonal variations in food supply. Both birds and land mammals are usually seasonal migrants, occupying savannas during and immediately after the wet season, moving elsewhere as the dry season approaches. Savannas can be associated with several types of biomes and are frequently seen as a geographic and environmental transitional zone. They occur between forest (or rainforest) and desert or prairie. The largest areas of savanna are found in Africa, Australia, India, Madagascar, the Myanmar-Thailand region, and South America. Savannas are an important ecosystem for the health and stability of the planet and places of profound beauty, adding to the human enjoyment and wonder of nature. Although the term savanna is believed to have originally come from an Arawak word describing "land which is without trees but with much grass either tall or short" (Oviedo y Valdes, 1535), by the late 1800s it was used to mean "land with both grass and trees." It now refers to land with grass and either scattered trees or an open canopy of trees. Spanish explorers unfamiliar with the term "sabana" called the grasslands they found around the Orinoco River "llanos," as well as calling Venezuelan and Colombian grasslands by that term. "Cerrado" was used on the higher savannas of the central Brazilian plateau. Many grassy landscapes and mixed communities of trees, shrubs, and grasses were described as savanna before the middle of the nineteenth century, when the concept of a tropical savanna climate became established. The Koppen classification system was strongly influenced by effects of temperature and precipitation upon tree growth, and his over-simplified assumptions resulted in a tropical savanna classification concept which resulted in it being considered as a "climatic climax" formation. The common usage meaning to describe vegetation now conflicts with a simplified yet widespread climatic concept meaning. The divergence has sometimes caused areas such as extensive savannas north and south of the Congo and Amazon Rivers to be excluded from mapped savanna categories. "Barrens" has been used almost interchangeably with savanna in different parts of North America; ecologically related are rock outcrop plant communities although fires are often not important to outcrop communities. Sometimes midwestern savanna were described as "grassland with trees." Different authors have defined the lower limits of savanna tree coverage as 5-10 percent and upper limits range from 25-80 percent of an area. Two factors common to all savanna environments are rainfall variations from year to year, and dry-season fires. Savannas around the world are also dominated by tropical grasses which use the C4 type of photosynthesis. In the Americas, savanna vegetation is similar from Mexico to South America and to the West Indies. In North America nearby trees are subtropical types, ranging from southwestern piñon to southeastern longleaf pine and northern chestnut oak. 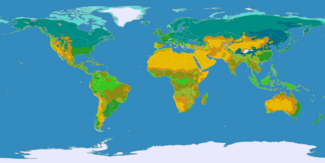 Tropical and subtropical savannas are classified with tropical and subtropical grasslands and shrublands as the tropical and subtropical grasslands, savannas, and shrublands biome. The savannas of Africa, including the Serengeti, famous for its wildlife, are typical of this type. Temperate savannas are mid-latitude savannas with wetter summers and drier winters. They are classified with temperate savannas and shrublands as the temperate grasslands, savannas, and shrublands biome. Mediterranean savannas are mid-latitude savannas in Mediterranean climate regions, with mild, rainy winters and hot, dry summers, part of the Mediterranean forests, woodlands, and shrub biome. The oak tree savannas of California, part of the California chaparral and woodlands ecoregion, fall into this category. Montane savannas are high-altitude savannas, located in a few spots around the world's high mountain regions, part of the montane grasslands and shrublands biome. 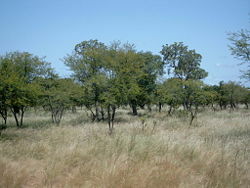 The highland savannas of the Angolan scarp savanna and woodlands ecoregion are an example. Prescribed fire during a burn to promote turkey brood habitat on the George Washington and Jefferson National Forests, Virginia (USA). Savannas are subject to regular fires and the ecosystem appears to be the result of human use of fire. For example Native Americans created the Pre-Columbian savannas of North America by periodic burning where fire-resistant plants were the dominant species. Pine barrens in scattered locations from New Jersey to coastal New England are remnants of these savannas. Aboriginal burning appears to have been responsible for the widespread occurrence of savanna in tropical Australia and New Guinea and savannas in India are a creation of human fire use. The maquis shrub savannas of the Mediterranean region were likewise created and maintained by anthropogenic fire. These fires are usually confined to the herbaceous layer and do little long term damage to mature trees. 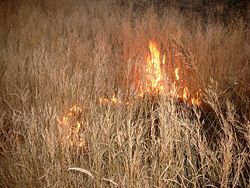 However, these fires do serve to either kill or suppress tree seedlings, thus preventing the establishment of a continuous tree canopy which would prevent further grass growth. Prior to European settlement aboriginal land use practices, including fire, influenced vegetation and may have maintained and modified savanna flora. It has been suggested by many authors that aboriginal burning created a structurally more open savanna landscape. Aboriginal burning certainly created a habitat mosaic that probably increased biodiversity and changed the structure of woodlands and geographic range of numerous woodland species. It has been suggested by many authors that with the removal or alteration of traditional burning regimes many savannas are being replaced by forest and shrub thickets with little herbaceous layer. The closed forests types such as broadleaf forests and rainforests are usually not grazed owing to the closed structure precluding grass growth, and hence offering little opportunity for grazing. In contrast the open structure of savannas allows the growth of a herbaceous layer and are commonly used for grazing domestic livestock. As a result much of the world's savannas have undergone change as a result of grazing by sheep, goats and cattle, ranging from changes in pasture composition to woody weed encroachment. The removal of grass by grazing affects the woody plant component of woodland systems in two major ways. Grasses compete with woody plants for water in the topsoil and removal by grazing reduces this competitive effect, potentially boosting tree growth. In addition to this effect the removal of fuel reduces both the intensity and the frequency of fires which may control woody plant species. Grazing animals can have a more direct effect on woody plants by the browsing of palatable woody species. There is evidence that unpalatable woody plants have increased under grazing in savannas. Grazing also promotes the spread of weeds in savannas by the removal or reduction of the plants which would normally compete with potential weeds and hinder establishment. In addition to this, cattle and horses are implicated in the spread of the seeds of weed species such as Prickly Acacia (Acacia nilotica) and Stylo (Stylosanthes spp.). Alterations in savanna species composition brought about by grazing can alter ecosystem function, and are exacerbated by overgrazing and poor land management practices. Large areas of savanna have been cleared of trees, and this clearing is continuing today. For example, until recently 480,000 ha of savanna were cleared annually in Australia alone primarily to improve pasture production. Substantial savanna areas have been cleared of woody vegetation and much of the area that remains today is vegetation that has been disturbed by either clearing or thinning at some point in the past. Clearing is carried out by the grazing industry in an attempt to increase the quality and quantity of feed available for stock and to improve the management of livestock. The removal of trees from savanna land removes the competition for water from the grasses present, and can lead to a two to fourfold increase in pasture production, as well as improving the quality of the feed available. Since stock carrying capacity is strongly correlated with herbage yield there can be major financial benefits from the removal of trees. The removal of trees also assists grazing management. For example, in sheep grazing regions of dense tree and shrub cover, predators are easily harbored, leading to increased stock losses while woody plant cover hinders mustering in both sheep and cattle areas. A number of techniques have been employed to clear or kill woody plants in savanna. Early pastoralists used felling and ringbarking, the removal of a ring of bark and sapwood, as a means of clearing land. In the 1950s arboricides suitable for stem injection were developed. War-surplus heavy machinery was made available, and these were used for either pushing timber, or for pulling using a chain and ball strung between two machines. These two new methods of timber control, along with the introduction and widespread adoption of several new pasture grasses and legumes promoted a resurgence in tree clearing. The 1980s also saw the release of soil-applied arboricides, notably tebuthiuron, that could be utilized without cutting and injecting each individual tree. In many ways "artificial" clearing, particularly pulling, mimics the effects of fire and, in savannas adapted to regeneration after fire as most Queensland savannas are, there is a similar response to that after fire. Tree clearing in many savanna communities, although causing a dramatic reduction in basal area and canopy cover, often leaves a high percentage of woody plants alive either as seedlings too small to be affected or as plants capable of re-sprouting from lignotubers and broken stumps. A population of woody plants equal to half or more of the original number often remains following pulling of eucalyptus communities, even if all the trees over five meters are uprooted completely. A number of exotic plants species have been introduced to the savannas around the world. Amongst the woody plant species are serious environmental weeds such as Prickly Acacia (Acacia nilotica), Rubbervine (Cryptostegia grandiflora), Mesquite (Prosopis spp. ), Lantana (Lantana camara and L. montevidensis) and Prickly Pear (Opuntia spp.) A range of herbaceous species have also been introduced to these woodlands, either savannas luh de humming now mate deliberately or accidentally including Rhodes grass and other Chloris species, Buffel grass (Cenchrus ciliaris), Giant rats tail grass (Sporobolus pyramidalis) parthenium (Parthenium hysteropherous) and stylos (Stylosanthes spp.) and other legumes. These introductions have the potential to significantly alter the structure and composition of savannas worldwide, and have already done so in many areas through a numbers of processes including altering the fire regime, increasing grazing pressure, competing with native vegetation and occupying previously vacant ecological niches. There exists the possibility that human induced climate change in the form of the greenhouse effect may result in an alteration of the structure and function of savannas. Some authors have suggested that savannas and grasslands may become even more susceptible to woody plant encroachment as a result of greenhouse induced climate change. However, a recent case described involved a savanna increasing its range at the expense of forest in response to climate variation, and potential exists for similar rapid, dramatic shifts in vegetation distribution as a result of global climate change, particularly at ecotones such as savannas so often represent. ↑ 1.0 1.1 1.2 David R. Harris. 1980. Human ecology in savanna environments. (London: Academic Press. ISBN 0123265509), 3, 5–9, 12, 271–278, 297–298. ↑ S. Saha, 2003. "Patterns in woody species diversity, richness and partitioning of diversity in forest communities of tropical deciduous forest biomes." Ecography 26: 80–86. ↑ 10.0 10.1 I. D. Lunt, N. Jones(2006). "Effects of European colonisation on indigenous ecosystems: post-settlement changes in tree stand structures in Eucalyptus–Callitris woodlands in central New South Wales, Australia." Journal of Biogeography 33(6): 1102–1115. ↑ S. Archer. (1994.) "Woody plant encroachment into southwestern grasslands and savannas: Rates, patterns and proximate causes." 13–68 in Vavra, Laycock and Pieper eds. Ecological Implications of Livestock Herbivory in the West. (Denver: Society For Range Management). ↑ Archer, S. (1991). Development and stability of grass/woody mosaics in a subtropical savanna parkland, Texas, USA. Savanna Ecology and Management Australian Perspectives and International Comparisons. P. A. Werner. Oxford, Blackwell Scientific Publications. ↑ Allen, C. D. and D. D. Breshears (1998). "Drought-induced shift of a forest–woodland ecotone: Rapid landscape response to climate variation." Proceedings of The National Academy of Sciences 95: 14839–14842. Allen, C. D. and D. D. Breshears (1998). "Drought-induced shift of a forest–woodland ecotone: Rapid landscape response to climate variation." Proceedings of The National Academy of Sciences 95: 14839–14842. Anderson, Roger C., James S. Fralish, and Jerry M. Baskin. 1999. Savannas, barrens, and rock outcrop plant communities of North America. Cambridge, UK: Cambridge University Press. ISBN 052157322X. Archer, S. (1991). "Development and stability of grass/woody mosaics in a subtropical savanna parkland, Texas, USA." Savanna Ecology and Management Australian Perspectives and International Comparisons, P. A. Werner. Oxford, Blackwell Scientific Publications. Archer, S. (1994.) "Woody plant encroachment into southwestern grasslands and savannas: Rates, patterns and proximate causes." 13–68 in Vavra, Laycock and Pieper eds. Ecological Implications of Livestock Herbivory in the West. Denver: Society For Range Management. Burrows, W. H., J. C. Scanlan, et al. (1988). "Plant ecological relations in open forests, woodlands and shrublands." Native pastures in Queensland their resources and management. W. H. Burrows, J. C. Scanlan and M. T. Rutherford, eds. Brisbane: Department of Primary Industries. Dyer, R., A. Craig, et al. (1997). Fire in northern pastoral lands. Fire in the management of northern Australian pastoral lands. St. Lucia, Australia: T. C. Grice and S. M. Slatter, Tropical Grassland Society of Australia. Flannery, Tim. The Future Eaters: An Ecological History of the Australasian Lands and People. Melbourne; London: Grove Press, (1994) 2002. ISBN 0802139434. Harrington, G. N., M. H. Friedel, et al. (1984). "Vegetation ecology and management." Management of Australia's Rangelands. G. N. Harrington and A. D. Wilson. Melbourne: CSIRO Publishing. Harrington, G. N., D. M. D. Mills, et al. (1984). "Semi-arid woodlands." Management of Australia's Rangelands. G. N. Harrington and A. D. Wilson. Melbourne: CSIRO Publishing. Harrington, G. N., A. D. Wilson, et al. (1984). "Management of Rangeland Ecosystems." Management of Australia's Rangelands. G. N. Harrington and A. D. Wilson. Melbourne: CSIRO Publishing. Lentz, David Lewis. 2000. An imperfect balance: landscape transformations in the Precolumbian Americas. (The historical ecology series.) New York: Columbia University Press. ISBN 0231111576. Lodge, G. M. and R. D. B. Whalley (1984). Temperate rangelands. Management of Australia’s Rangelands. G. N. Harrington and A. D. Wilson, eds. Melbourne: CSIRO Publishing. Lunt, I. D., N. Jones, (2006). "Effects of European colonisation on indigenous ecosystems: post-settlement changes in tree stand structures in Eucalyptus–Callitris woodlands in central New South Wales, Australia." Journal of Biogeography 33(6): 1102–1115. Mott, J. J., R. H. Groves, (1994). Natural and derived grasslands. Australian Vegetation. R. H. Groves, ed. Cambridge: Cambridge University Press. Partridge, I. (1999). Managing grazing in northern Australia. Brisbane: Department of Primary Industries. Pressland, A. J., J. R. Mills, et al. (1988). Landscape degradation in native pasture. Native pastures in Queensland their resources and management. W. H. Burrows, J. C. Scanlan and M. T. Rutherford, eds. Queensland: Queensland Government Press. Queensland, and S. L. Boulter. 2000. Native vegetation management in Queensland: background, science and value. Brisbane, Qld: The Dept. Saha, S. 2003. "Patterns in woody species diversity, richness and partitioning of diversity in forest communities of tropical deciduous forest biomes." Ecography 26: 80–86. Scanlan, J. and C. Chilcott (2000). "Management and production aspects." Native Vegetation Management in Queensland, S. L. Boulter, B. A. Wilson, J. Westrupet, eds. Brisbane: Department of Natural Resources. Smith, G., A. Franks, et al. (2000). "Impacts of domestic grazing within remnant vegetation." Native Vegetation Management in Queensland. S. L. Boulter, B. A. Wilson, J. Westrupet, eds. Brisbane: Department of Natural Resources. Tothill, J. C. and C. Gillies (1992). The pasture lands of northern Australia. Brisbane: Tropical Grassland Society of Australia. Werner, P. A., B. H. Walker, et al. 1991. "Introduction." Savanna Ecology and Management Australian Perspectives and International Comparisons. P. A. Werner, ed. Blackwell Scientific Publications. Wilson, B., S. Boulter, et al. (2000). "Queensland's resources." Native Vegetation Management in Queensland, S. L. Boulter, B. A. Wilson, J. Westrupet, eds. Brisbane: Department of Natural Resources. Winter, W. H. (1991). "Australia's northern savannas: a time for change ion management philosophy." Savanna Ecology and Management Australian Perspectives and International Comparisons. P. A. Werner, ed. Oxford: Blackwell Scientific Publications. ISBN 0632031999. This page was last modified on 21 August 2015, at 15:19.